Belimed Inc. launches a new Direct Dock option to expand the successful WA290 Automation product family. Belimed Inc. part of the Belimed Group, a world leader in cleaning and sterile processing systems in health care and life sciences, has released a new option for washer automation, the WA290 Direct Dock. The Direct Dock is designed to fit in smaller spaces, allowing more facilities access to superior WA290 technology. Distinct features of the Direct Dock include a smaller footprint to fit in challenging space requirements, and a docking system designed for easy load and unload, making the system ideal for those that prefer using transport carts in their workflow. Belimed Inc. is a leading supplier of technology based cleaning, disinfection, and sterile processing products and services for Medical and Pharma, hospital and healthcare systems across the Unites States, and around the world. 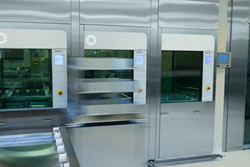 Belimed Inc., http://www.belimed.com, ensures absolute customer confidence in their sterile processing areas by providing solutions that increase efficiency while ensuring high quality reprocessing, decontamination, and sterilization results.